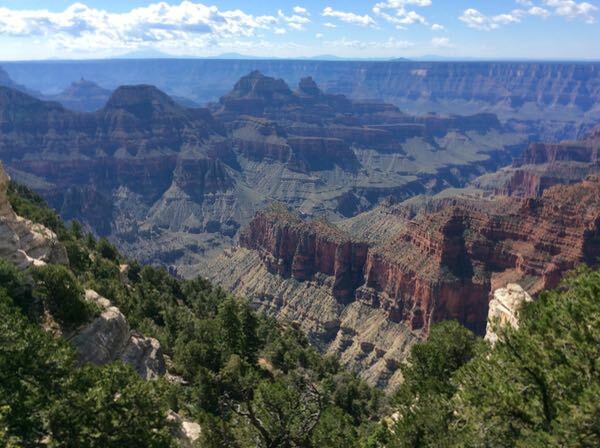 I finally made it to Grand Canyon-North Rim to see the magnificent views of the big hole. A year and a half ago I came; but, it was not yet open due to snow. Many prefer the north side for the scenery and smaller crowds. That sounded good to me; so, I tried again. 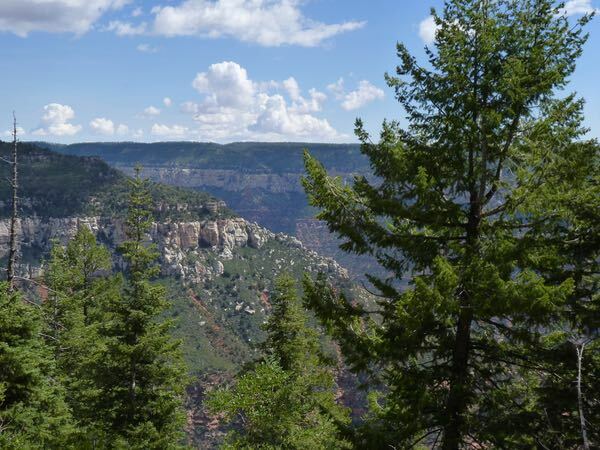 The elevation was about 1,000ft higher than the South Rim, so it was cooler; and there were tall pines and aspen trees. There was less development and the atmosphere was more relaxed. Those things made for a more pleasant experience while enjoying the views. I meandered around the lodge, had lunch at the deli, walked the Bridal Path and a short segment of the Transept Trail. Then I hiked out to see the view from Bright Angel Point. All those things were near the Visitor Center. Then I drove the scenic road to several overlooks. Each had its own character with different features emphasized. 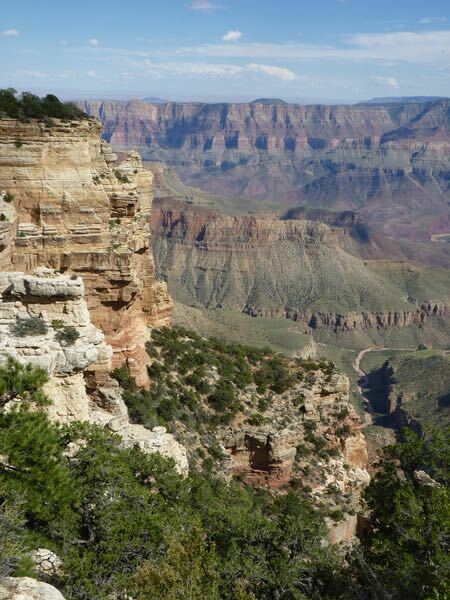 Of course, along with the backdrop of the expansive canyon. Most of the stops had few visitors; Bright Angel, by the lodge, and Cape Royal, at the end of the road, seemed to have the most. Along the way there were some trailheads for hiking. 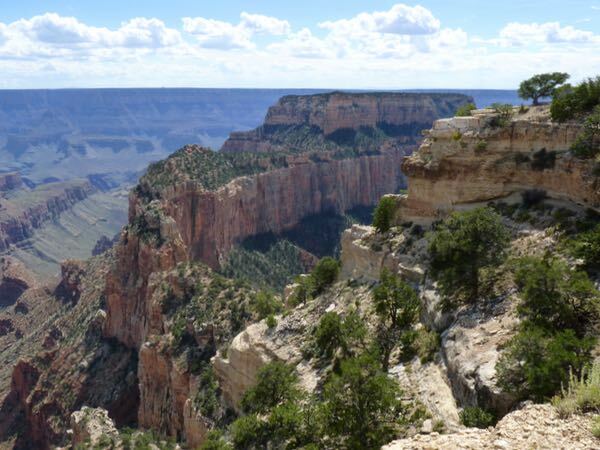 Most were away from the canyon edge; those into the canyon required a special permit. It was raining on-and-off and I didn’t feel up to doing one. 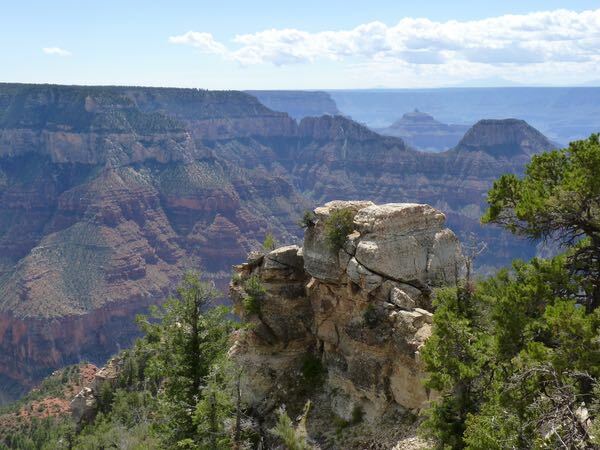 I really enjoyed seeing the Grand Canyon from the North Rim. 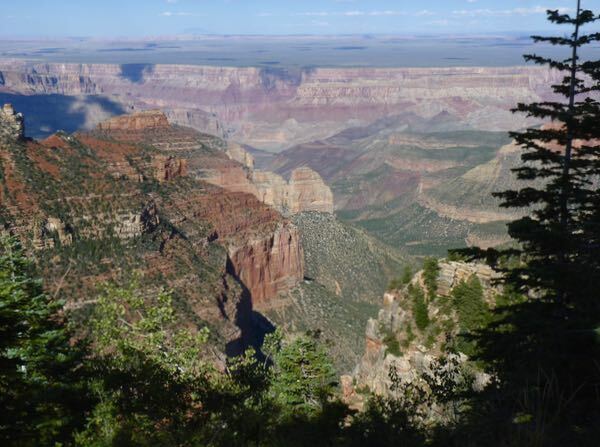 Each overlook had a unique view of the canyon and great photo angles. Easy access and fewer people made for a relaxed tour. After touring the viewpoints, I went looking for a new camp in the forest. This time, I found a nice boondock spot not far off the highway, and with good internet. So-o-o glad I went to the North Rim! I much preferred the North Rim. I’m with you on that Barney. BTW, glad you made it to NM. So beautiful and so much quieter than the South Rim, one of these days we’ll manage to get back there. Have fun! 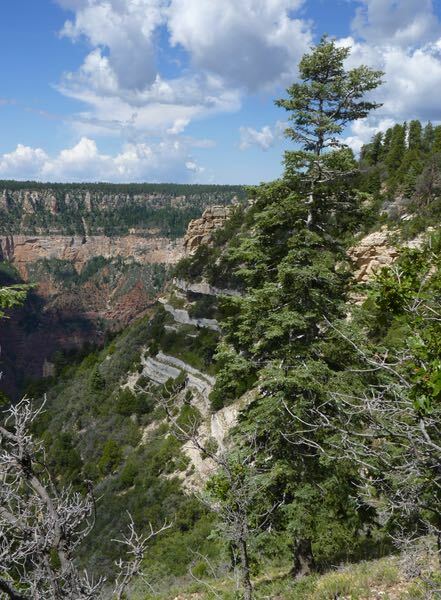 Yes; a much better experience at the North Rim. Spectacular pictures! I also prefer to visit and camp away from the crowds. It looks like you had a great tour and plenty of time to enjoy the view. Thanks Brad. I really enjoyed my time there on the north side of the canyon. Been following your travels for a while now, and have been enjoying your blog. 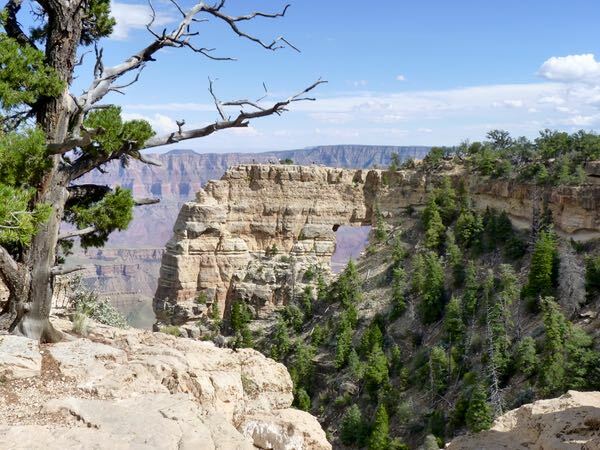 I am planning a trip to the North Rim myself and have been wondering when the weather gets too cold to go there at this time of the year. So, I am wondering exactly when you were there and what the weather was like. Thanks for following the journey Peter. 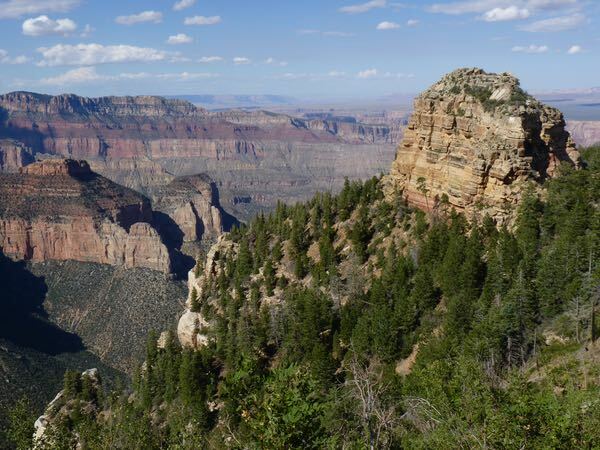 I was at the North Rim September 5-9, and the weather was near perfect; highs in 70s, lows in 40s. I would expect the end of October would be the latest you would want to be there. 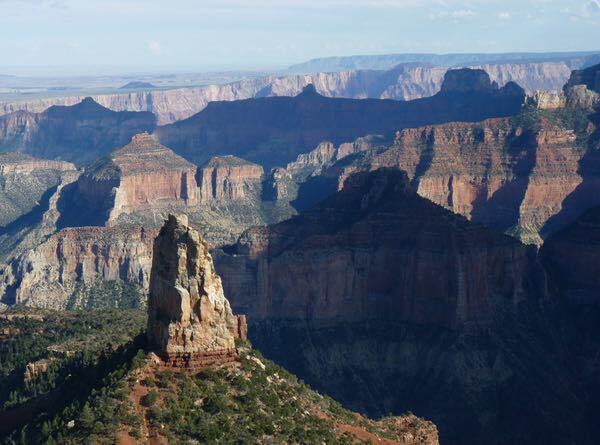 Why not contact the North Rim Visitor Center and ask about the time you want to visit?